This is a funny moment of Heather and Clay immediately after the ceremony as they were announced husband and wife. Clay is a silly guy and Heather always seems to be entertained by him and this shows their relationship perfectly! 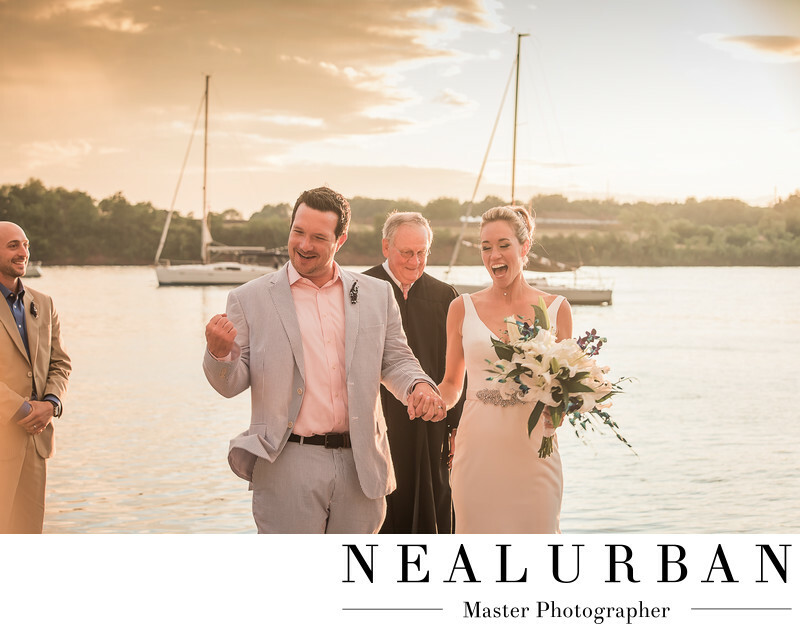 They had their ceremony and reception at the Youngstown, NY Yacht Club on the lower Niagara River near Fort Niagara. After their first look and portraits taken inside the Fort we all went back to the Yacht club for cocktail hour. Yes, they had a cocktail hour before the ceremony! Unfortunately, mother nature stepped in a poured down on the area. The skies got really dark and the winds picked up. All of their guests stayed dry underneath a huge tent. People kept their eyes on the weather apps. We as photographers always know that we often get the most beautiful sunsets after it rains. The storm cell was a blip on the radar and it looked like it was going to clear up for the rest of the night. Once it stopped raining everyone chipped in to dry off the seats. Once everything was dry Heather and Clay got married as the sun set behind them and they had the most beautiful colors in the sky. After all that is said, now you understand the expressions on their faces... Victory!